The judges sent home the wrong dancer. Ashley is one of my favorites, but her dance for her life routine was completely lackluster, it had such a casual feel to it and not like someone who was fighting to stay in the competition. Caitlynn’s was kinda clunky and I have to say a bit stumbling and awkward, her rhythm was off. While Miranda’s was breathtaking and amazing. That girl really was dancing for her life and she was stunning. Why on earth did they send her home?? The guys were a harder call. Each routine was stellar. I personally find Robert a little annoying, and I feel bad saying that because he’s obviously a sweet guy, so sending him home was the lesser of three evils for me, but that was really an impossible decision. They were all so great. But Robert was the most limited, perhaps. Chris seems more able to … expand. 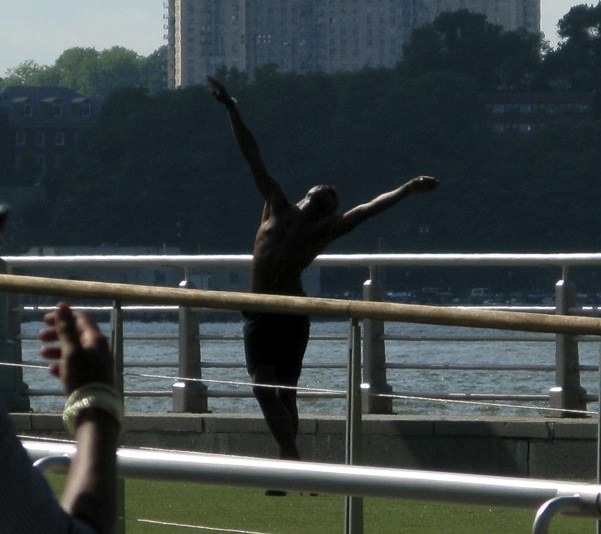 I was writing on the river last night and was treated to this beautiful dancer practicing on the pier. Ha. He was such a gorgeous dancer. I wish I was closer. I took that from pretty far away.